BEYOND TWO STATES: IS CONFEDERATION THE SOLUTION TO THE ISRAEL-PALESTINE CONFLICT? A series of recent polls has found support for a two-state solution continuing to slide: Less than 50 percent of both West Bank/Gaza Palestinians and Jewish Israelis now back the idea in principle; even fewer believe a two-state solution is viable. In light of the shifts in public opinion, the perpetual growth of West Bank settlements, and the absence of progress toward peace, some, on the Right as well as the Left, are offering a new model for conflict resolution: An Israel-Palestine confederation. 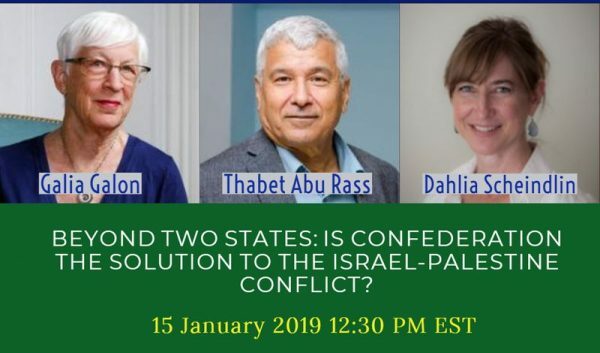 Please join us as we learn more about the confederation model: How does it differ from the traditional two-state approach? What unique solutions does it offer for the conflict’s more intractable issues? Why are those on both sides of the political spectrum intrigued by this possible approach? And is it feasible amid today’s reality?